For the average person, Valentines Day is a day of flowers, chocolates, and showing loved ones how much they’re appreciated. But for haunt fans and those who fall on the spookier side, Valentines Day is now a chance to once again journey to the dark and twisted landscapes provided by haunted attractions across the country. 13th Floor Haunted House Chicago in Melrose Park, IL is no exception. Their event, Valentine X, thrusts visitors into the world of the Bear Butcher and his minions as they wreak havoc upon their victims on Valentines Day in an attempt to purify them. This attraction is a visceral, violent experience, and one not to be missed. Utilizing the sets from the Halloween season with a bit of retooling, Valentine X turns off the lights and envelops the attraction in deep, inky darkness. Candles placed along the pathways are the only light available to guide visitors, creating a textured, more intimate experience. One of the things 13th Floor does well is build impressive sets, and the low light augments the existing set detailing to create an ominous, foreboding landscape. You’re never quite sure if there’s actually something moving between the tombstones or down the dark passageways, or if it’s just a trick of the light. There is an unsettling feeling walking through the house, which perfectly sets the scene for the actors to startle and scare even the most grizzled of haunt goers. In our first visit to 13th Floor Chicago, one of the issues we had was with the actors’ interactions, or lack thereof. And with an event like Valentine X, where much of the existing special effects are used sparingly or just turned off completely to augment the darker setting, performances will make or break the event. But this problem has not only been tackled head on for Valentine X, there is an added level of intense brutality in the actors’ performances that really gives them a razor sharp edge. “Mike Faust, our perfomance director, travels to the different [attractions] and works with the crews and actors,” Mike Krausert, Senior Project Manager, told us. “Each show is different, and there’s a way to approach what the backstory is, what the theme is. And there’s always intensive training that goes along with it…We want the people in there giving it their all so the customers have that experience.” Victims of the Bear Butcher plead for help, and are mercilessly dragged and flung across floors before being dispatched. There are also other ghouls and creatures that roam the event, and the actors inhabit the roles beautifully. With over 40 actors roaming the attraction and putting so much energy into their roles, characters feel fleshed out and the world becomes much more realistic as a result. If you’re looking for some scares with your candy hearts this year, 13th Floor’s Valentine X is the place for you. The combination of immense, beautifully intricate sets; low light to set the mood; and energetic, intense actor performances makes this event one you must visit. 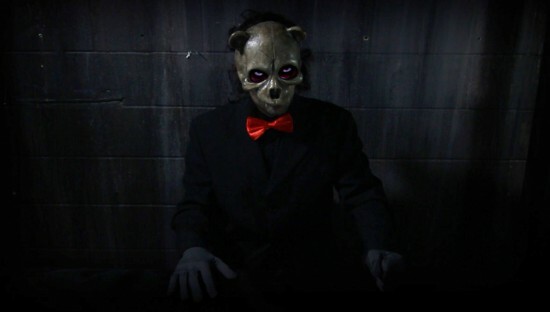 13th Floor Haunted House Chicago’s Valentine X event only runs through February 14, so don’t miss your chance to meet the Bear Butcher and his minions before they slip back into the darkness for another year. The event is open from 7:30 PM – 10:30 PM, and tickets are $24.99 for general admission and $34.99 for fastpass reservations. Get social with Behind the Thrills on Facebook and follow along with us on Twitter @BehindThrills for the latest updates! Click here for more information about Valentine X and to buy tickets.